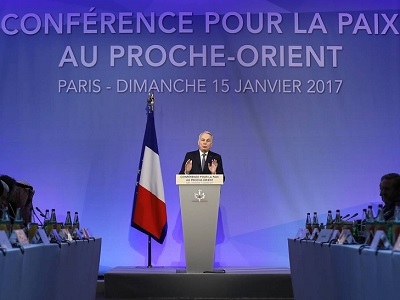 An international peace conference involving more than 40 foreign ministers and senior diplomats from 75 countries began in Paris on Sunday morning, aimed at renewing efforts to resolve the decades-old Palestinian-Israeli conflict through the two-state solution. 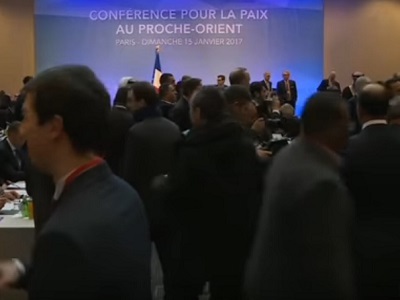 The Paris conference has been welcomed by the Palestinian Authority, while the Israeli government has boycotted the summit for its exclusion of Palestinian and Israeli officials, with Israeli Prime Minister Benjamin Netanyahu insisting ‘bilateral negotiations’ were the only viable option for peace talks. However, French President Francois Hollande assured on Thursday that the conference would not aim to replace bilateral negotiations between Israelis and Palestinians. He reportedly also thanked US Secretary of State John Kerry for his “tireless efforts to promote the peace process,” after Kerry recently gave a blistering speech condemning Israeli settlements in the occupied Palestinian territory. The summit is being held weeks after the United Nations Security Council passed a resolution reaffirming all Israeli settlements in the occupied Palestinian territory were illegal under international law. “UN Resolution 2334 reaffirmed the need for the two-state solution. Now is not the time to stop,” Ayrault reportedly said in his opening remarks. The conference is notably taking place days before the inauguration of US President-Elect Donald Trump on Jan. 20, with French diplomats reportedly saying the timing was an intentional move to send a message to Trump about the importance of resolving the conflict. Palestinian daily al-Ayam meanwhile published what it said was a final draft resolution for the Paris Conference, which reportedly called for an end to Israel’s illegal occupation that began in 1967, and said that states participating in the conference would agree not to recognize any borders that were not reached through direct talks between Israel and the Palestinians — including in Jerusalem.